Our headphones has separated plugs for mic and headphones, which both are 3.5mm in size. A adapter will be need if you use 1/4 inch plugs. There is no a mute button on the headset. Please control the volume by built-in volume control button if you want to mute. This headphone is ended with 2*3.5mm audio cable instead of USB. The microphone is adjustable and bendable. Only using with a 1/4 inch plug can the headset be used in cellphone. You can use it on Xbox one, as long as your Xbox one controller has 3.5-mm port, you can plug in any VCOM compatible headset with the 3.5mm stereo headset jack. Easy-to-Reach support with friendly customer service. We strive to make the best kids headphone you've ever used. Please let us know if you are not satisfied with them, we promise a 100% MANUFACTURER MONEY BACK GUARANTEE. SPECIFICATION: 6.89 feet long cord with 2 x 3.5mm plug type, suitable for PC, MAC, Laptop, Notebook and other devices using. ADJUSTABLE AND FLEXIBLE HEADHAND: adjust the headset to a comfortable wearing position for yourself so you can enjoy music or your game. LIGHTWEIGHT AND PORTABLE HEADSETS: easy to carry. 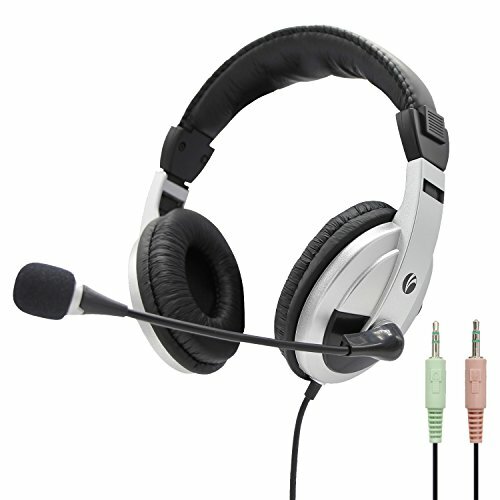 Suitable for office, classroom or home use or business, video or voice chat, gaming or entertainment.